Posted Apr 02, 2019 by Eds. The response was the same in the neighborhoods: people on the sidewalks, cars with the lights on to illuminate a game of dominoes, some beers where there was calm, waiting for the light to return, texts, Wi-Fi. The middle-class areas cooked for a while, then silence. Nothing collapses, against the predictions of many. Two plus two do not equal four in Venezuela, if you look at it from the depths of the people. It returned at 22.15, and an hour later it left again. In total, nearly twenty states were affected, and almost all of the capital. It is impressive to see Caracas frozen, especially from the top of a hill. Three weeks after the start of the electrical war, Chavismo maintains, through evidence, that it is a strategy of attrition implemented within the framework of the attempted coup d’état. The right claims that everything is the responsibility of the government, corruption and inefficiency. The majority are convinced that there will be more blackouts. Saturdays have become a day of mobilization for Chavismo, and sometimes the right wing. The biggest difficulty is to accomplish this when, like this Saturday, the city again found itself without a subway due to the blackout. It was the second day in which Chavismo found itself facing the challenge of a mobilization without subway service, and, as before, it managed to demonstrate its strength. It once again asserted, as it has done since the beginning of the year, that it is a popular force that has not lost the streets. And also, against all the forecasts of the right. Juan Guaidó, for his part, had called for a day of protest against the power cuts. His rally had a small turnout, worryingly small for his needs. The Guaidó effect is in the process of deflation. His two main troubles are to have promised what he could not do, and to appear more and more like a typical leader of the right, rejected by his own social base because of his frauds. What’s next? Guaidó announced that on April 6 he will make a “first simulation of operation freedom”. He has not yet explained what the operation consists of, in terms of its dimensions of simulation, it has only generated more disappointment in those who believe in the immediate departure of Nicolás Maduro. After two months, the images are clear: Chavismo has maintained its capacity for mobilization, while the right wing is in the process of losing what it had managed to regain on January 23. In the streets of Caracas there is the usual tranquility, however, international confrontation is escalating. First it was Donald Trump, who, during the act in which he received Guaidó’s wife, Fabiana Rosales, affirmed that “Russia must leave Venezuela”. His statements were in reference to the arrival of two Russian planes at Caracas airport on March 23, with equipment and officials to carry out technical-military contracts between the two countries. Shortly before Russia’s declaration, China had issued a declaration of support for the Venezuelan government from the mouth of Geng Shuang, spokesman for the Ministry of Foreign Affairs: “Latin America is not owned by any country, nor is it the backyard of any state”. Venezuela has become the flashpoint for geopolitical disputes, particularly between the US and Russia. The aggravating factor for the policy of Donald Trump and the US deep state is that this struggle is now over a territory that would have been under the exclusive control of the US. The evolution of the international dimension had another element: the announcement by the Red Cross that it will distribute humanitarian aid in Venezuela in two weeks’ time. He has not yet said how she will be brought in and whether they spoke to the government. The Red Cross emphasize the “apolitical” character of the humanitarian aid, but the right have taken credit for the announcement as its own achievement, and this policy corresponds exactly to the one proposed by the United States. 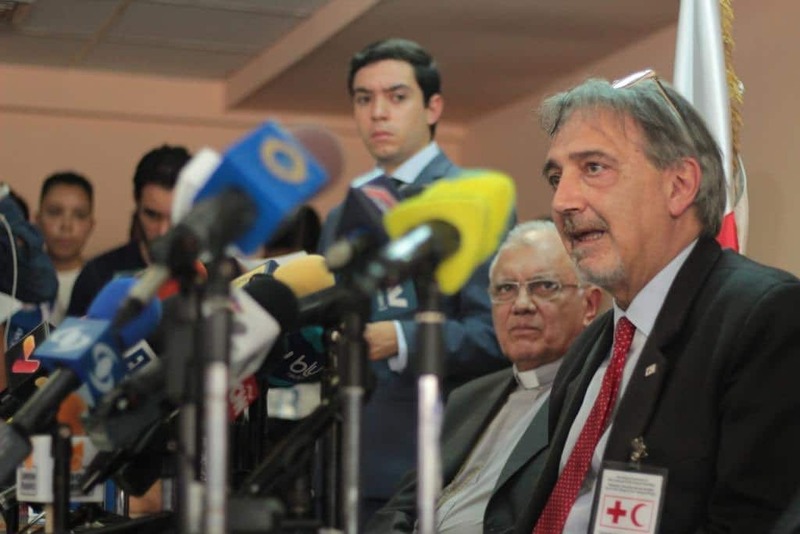 Evolving events will give further indications of the objectives of the Red Cross. For the time being, the situation in Venezuela remains stable.